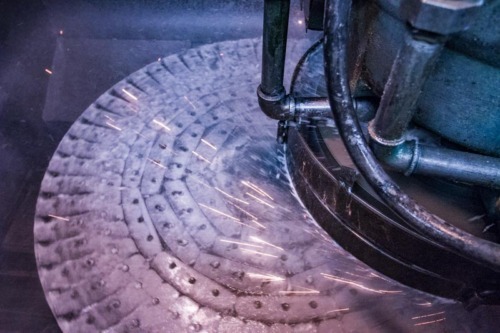 Grinding - Dubuque Stamping & Manufacturing, Inc. The Blanchard surface grinder allows us to grind one side of the part at a time while holding the parts on a large rotating magnetic table. If the part requires both sides of the part to be ground, parts are flipped after the first side is ground. Depending on the design of the part, our Blanchard grinders are capable of grinding parts to a ±.001” thickness tolerance while maintaining the flatness of the part. Our Gardner double disc grinders grind both sides of the part simultaneously while they pass through the machine. These machines are better suited for larger quantity production runs due to its pass through mode of operation. Depending on the design of the part, our Gardner grinders are capable of holding ±.001” thickness tolerance. Progressive dies provide a completed part on each stroke of the press. This is best suited for higher-volume parts. Various draw type parts can be produced for special usage such as Oil Filter Shields.